This post works the same for AutoCAD and AutoCAD Architecture. 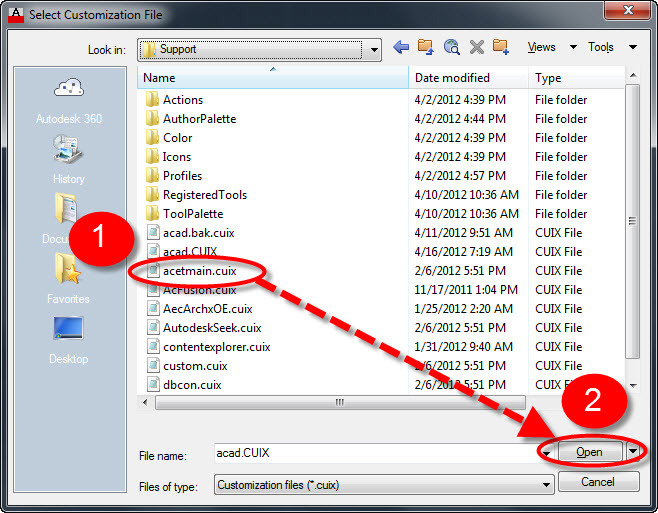 This entry was posted in AutoCAD 2013, Customization, Express Tools, Manage, New In 2013, TIPS. Bookmark the permalink. After the express tools have been installed you can also type EXPRESSTOOLS at the command line and it will load the menu for you. That’s because you are using an illegal version of Autocad Sajjad. Hey thanks Matt. I did get my express tools. However, the txt2mtxt gets an error as an unknow command. I’ve googled this and not found much to help on this. Any suggestions? I have the same problem with TXT2MTXT and a few other Express Tools; I’ve reloaded ’til I’m blue-in-the-face… Have you found a solution? If you feel comfortable doing so, you can partially load the Express.cuix through the CUI. Expand the “Partial Customization Files” list and check to see if “EXPRESS” is showing. If not, click the folder button that has a little green plus sign on it. Thanks alot for these detailed explanations. I followed these and Express Tools appeared but not all of its commands are activiated. Some like Arc Aligned is working and some like Command Alliases and Replace Block don’t work. My suggestion would be to re-install or contact Autodesk. In the mean time, you can use lisp routines that perform these tasks. I think that tends to be too much of a rush to push these releases out the door. I wonder if instead of a yearly release if it would be better to have a new release every other year. Had similar issue with “Flatten” command not working. Solution was to add a path in Options>>Files>>Working Support File Search Path. My path was C:\program files\autodesk\autocad architecture 2012\express. Yours may vary depending on installation. It should be an existing folder you can Browse to, rather than typing the path. Perfect, this solution also helped me in 2013. After all the searching I did this was the ONLY solution I found that worked. Thank you so much for taking the time to share this tip. Massive time saver for me. You are the man! you example works great! Had the same issue with 2013, the burst command was not working even though EXPRESS was showing up in the Ribbon and MENULOAD. I found the following method and it worked. I don’t know if it would work for any other commands but here it is: Use the command APPLOAD and load the two files in the Express folder called “acettest.fas” and “acetutil.fas”. It started working after that. worked like a charm for me, thanks!! This worked for me with Block Replace…Thank you so much!! That worked for me as well… Thanks for the tip.. Thanks a lot Brad!!! Save my day!! 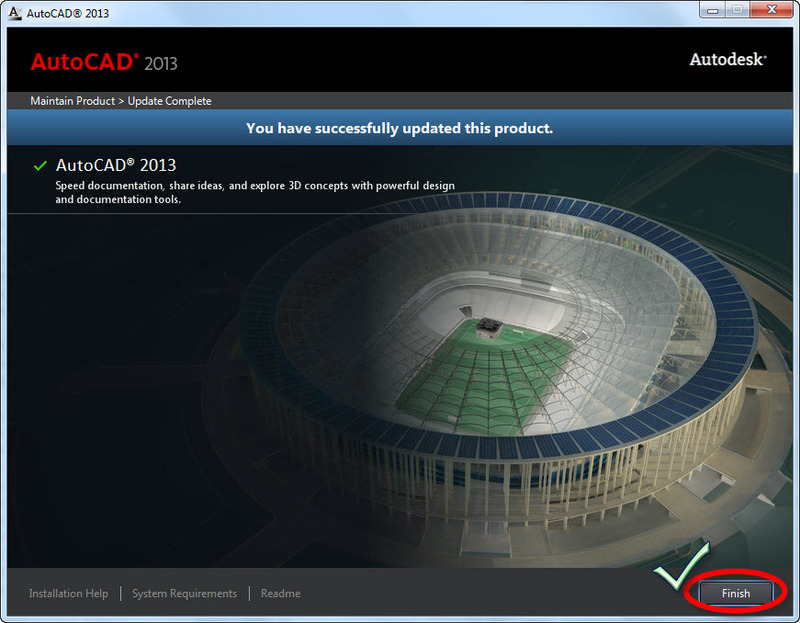 Hi, I’m using AutoCAD Architecture 2013 . . .
as a new user I am certainly curious about many things . . . 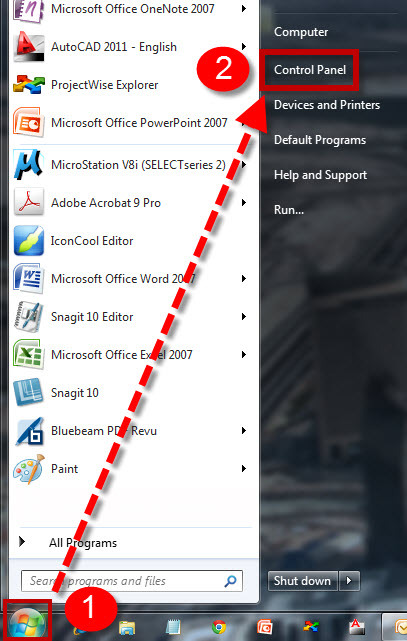 I try to collapse-expand the menu bar, move it to the left side of screen . . .
Then I forget till I lost my menu bar . . . Please, can you help me to make my menu bar appear again? Sorry, if it’s not related to your post, about express tools . . . Try typing RIBBON into the command line. Also, if you want the old style menus to show above the ribbon, this is also available in the command line, simply type MENUBAR into the command line and then set it to 1. I was looking for loading express tools for 2 weeks, and I finaly find instuction which ended on updating in control panel. I made basic mistake: I was looking only in Polish language. Now i see that that is so easy! Thanks a lot!!! thank you for this detailed instruction, please continue to share some info..like this..thanks a lot!!!! To see a list of the default alias already defined use the ALIASEDIT command and browse to see what is available. 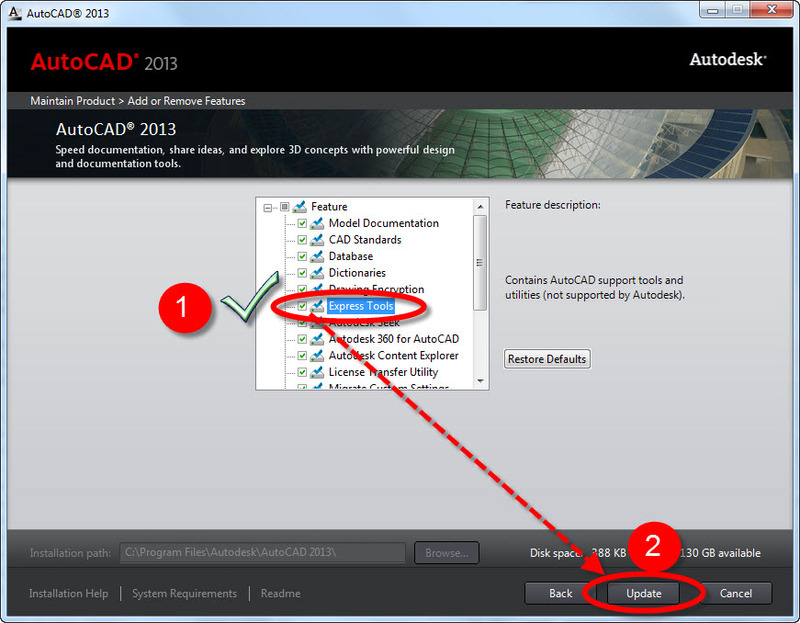 Can you migrate EXPRESSTOOLS from say AutoCAD 2012 to LT 2013? unfortunately AutoCAD LT cant run Express Tools by default. There is this add on that claims to be able to run lisp routines and be able to use 3D with LT. I think that there are other packages as add-ons for LT there as well. Instead of using an add-on that may or may not work, I would seriously suggest looking into one of the other “CAD clones” on the market. They mimic AutoCAD in look and functionality and are really affordable. Here is a link to a review of some CAD clones that cost around $500. Cadsta Max should do the job. I am trying to install Express tools in AutoCAD Architecture 2013, when I go to “Add/Remove Features” I only see language packs. No Express tools or any other addons like you have pictured above. Any ideas? My only thoughts as to why they are not available at all is that they were not included in the initial install. Unfortunately, I think that a complete, uninstall and re-installing the software from the original disk or thumb drive (or download) might be the best bet to make sure that the express tools get at least copied to the computer. Thanks Brad!!! Those specific files didnt make it work but I simply started going down the list loading them all and now it works! I have acad mep 2013 and had a very hard time getting any of it to work until the suggestion of going to appload and loading the .fas files. I don’t know what they are or wath they do, but that seemed to work… now I have access to Burst again…. sweet! I have successfully loaded express tools as you described above and would like to say thanks. I have the ribbon but many of the commands don’t work. Where are all the support files to run the expresstools? Prior to finding this post I was able to get the ribbon to load with the EXPRESS. However, the commands never worked until I copied the “EXPRESS” directory from the installation disk to my hardrive. That was the only way I was able to get them going. SIMPLE but ridiculous. 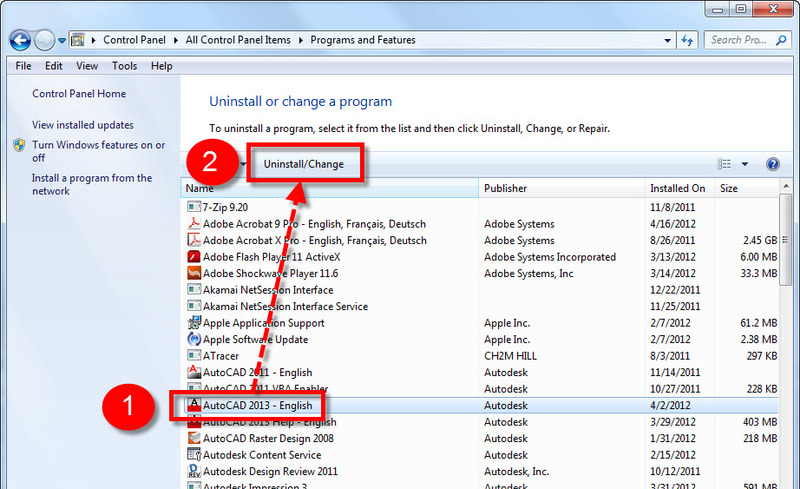 i have a licensed version of autocad lt 2012… plz guide me to install express tools in lt ’12 version. 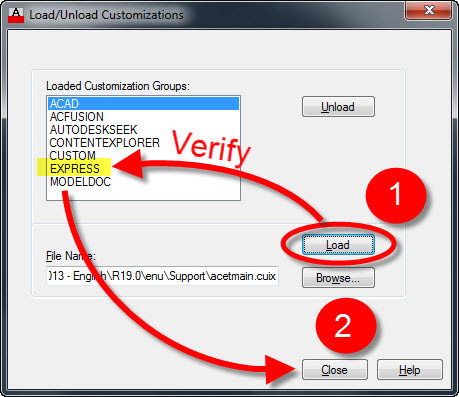 The following link shows how to load express tools for AutoCAD Architecture 2012 but invlove the same steps for regular AutoCAD. Also note the comments on the bottom of the post. There are some helpful tips there as well. How about express tools in CAD 2013 for mac? any solutions? Unfortunately, the express tools are not available for AutoCAD for MAC. The best bet for some of the tools found in the Express Tool is finding an AutoLISP version of a needed Express Tool from a help forum. AutoCAD for Mac can use AutoLISP but not Visual LISP. Mil gracias. Funcionó perfecto. Un saludo. For everyone who has express tools loaded but still can’t use txt2mtxt among other things, this video shows how to fix it. Grazie! Fantastico funziona tutto!!! Bravissimo! Where are them located, and how to load them in the Design Tools in an specific palette for every one ? Where are the other tools as: Electrical Outlets, Panels, Incandescent, ands where are the Parking tools, Cars, etc. I am using AutoCAD 2013 architecture and Express tool is loaded. ATTDIA, FILEDIA AND CMDDIA all have value of 1. Overkill command would not load the dialog box. Any help would be appreciated. Thank you. I’m sorry for the delay in response. Overkill is no longer an express tool. It is now part of AutoCAD’s base commands (since ACAD 2012). Since you know that the various dialog box variables are set to I am wondering if during the installation, maybe your anti-virus program didn’t let you install these dialogs. I know that sounds odd, but anti-virus programs and AutoCAD don’t play well together and this has been a known issue. 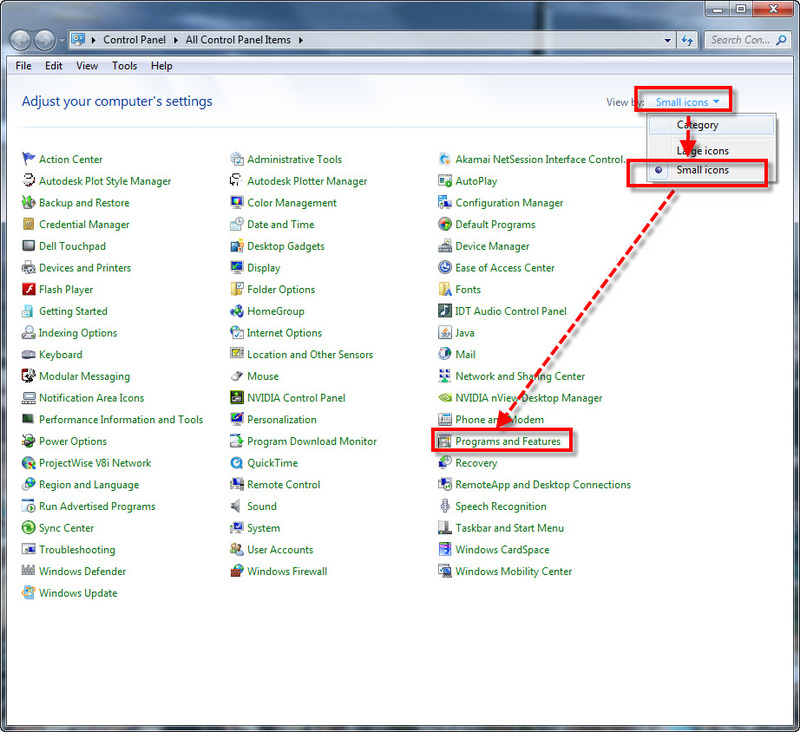 Another thing is to make sure that you are added as an Administrator to the computer. I have solved the mystery but not sure of the reason why. I basically use “_overkill”, yes with an underscore in front as legacy version. I went through the entire command process to remove duplicates, then come back with the “overkill” command, then the dialog box magically re-appears. I can’t explain why but it worked out fine. It has worked ever since. Thanks for the tips however. Here are some prefixes to commands that you may come across when seeing LISP, Scripts, Macros etc from the internet and also when you check out the macro that defines a command in the CUI editor. The the line command is called with the underscore before it. The underscore forces the command to use the English version of the command. The period forces the command to use the out-of-the-box (OOTB) defined version of the command. This is in case someone has redefined a command. These can all be strung together before a command if needed. This will use the OOTB, english version of the command without a dialog box. Its not working for me. There is a cross behind “Express Tools” when I check it to update. After clicking update button it asks about the location of “Acad.msi” but still shows an error after selecting the respective file. Thanks for the instructions. I followed them easily and installed express tools, however when I try to use them it still says unknown command. Not sure where to go from here. 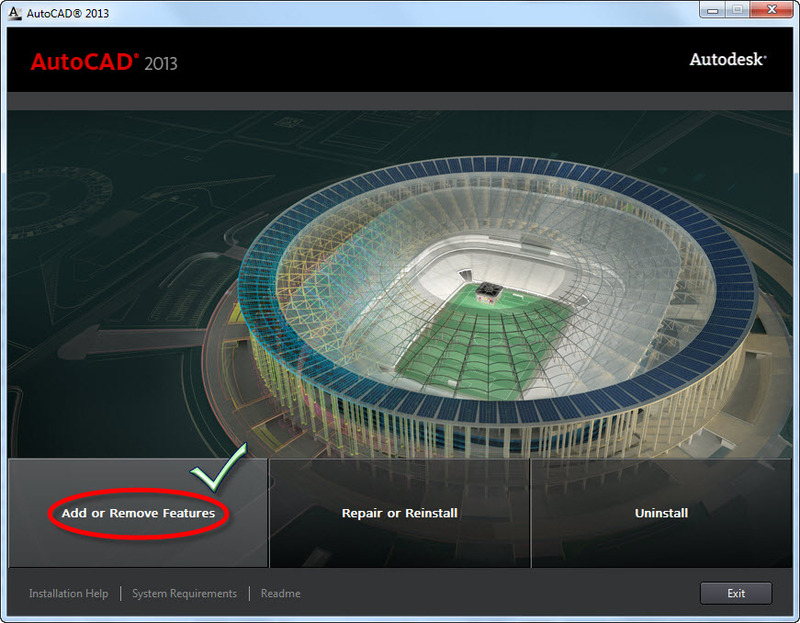 I am using AutoCAD MEP 2014 – English. Thanks for any suggestions you might have. Thank you! Solve my problem !! Thank you for your instruction. They where a great help – also for other versions of AutoCAD. is it possible for me to add some command as my desired?